This style of border could be used to frame a photograph, as a border for an image gallery online or as the background to a quirky illustration. 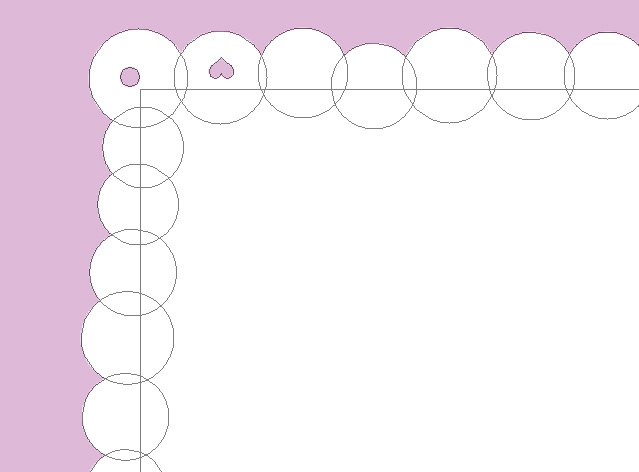 See the tutorial below for how to recreate this heart border with vector shapes in Photoshop. To create this border in Photoshop, we will be using vector shapes which can be sized up and down without losing quality so the size of the canvas is up to you. If you want to follow this tutorial exactly, create a canvas 600px x 800px. Use the paintbrush to fill the background layer with a colour of your choice. Choose the rectangle shape tool and draw a rectangle in the centre of the canvas. The heart border will be added to the outside of the rectangle so you will need to leave enough space on the outside to work with. Next choose the circular shape tool. Make sure you have the previous rectangle path selected in the layers palette and choose ‘add to shape’ from the option toolbar. Draw a circle over the top left corner of the rectangle. Repeat step 3 until you have created a line of circles along the top of the rectangle. They don’t have to be perfect circles or even in line with each other as it is the slight variations which help to give the quirky appearance to the border. 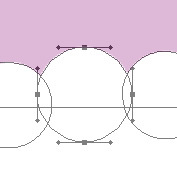 The circles need to overlap the rectangle and also the circles to the left and right so no gaps are created. If you need to reposition the any of the circles use the direct selection tool to select the outline of the individual circle. You will need to select all the points together to be able to move the heart, to do this press shift as you select the points. Use the arrow keys or the mouse to move the shape. Repeat the process and cover the rest of the rectangle with circles. You should be adding to the same shape layer throughout this process by having the ‘add to shape’ option turned on in the option toolbar. Still using the circle tool, change the setting in the option toolbar to ‘subtract from shape’ and place a small circle in each of the corner circles on the outside of the rectangle. You can use the direct selection tool to move the circle if you need to as before. Now to add the hearts. Choose the custom shape tool from the toolbar and choose a heart shape from the drop down menu in the option bar. Make sure the shape is set to ‘subtract from shape’. 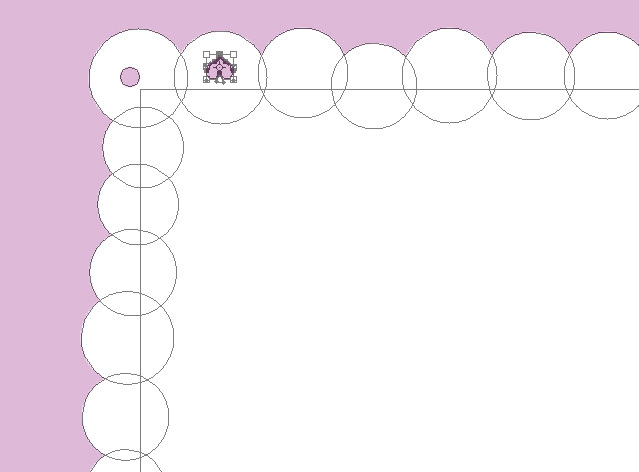 Start with the bottom line of circles and draw a small heart inside each of the circles between the rectangles border and the outside edge of the circle. If you need to reposition the heart, use the direct selection tool to select the outline of the heart and use the arrow keys or the mouse to move the shape. After the bottom row is complete you will need to make a start on the top border, to do this you will need to reverse the heart. With the subtract option selected draw a heart in the centre of the rectangle. Select the hearts points with the direct selection tool and use the transform controls to turn the heart upside down. ( ctrl T / apple T to transform). With the points still selected move the heart to the desired location. Use the transform tools to alter the size of the heart to fit the circle. Re-select the points of the heart with the direct selection tool and copy and paste (ctrl c ctrl v / apple c apple v) a new shape. The new path will be placed directly on top of the original heart so it won’t be immediately apart that anything has changed. Use the cursor keys or mouse to move the heart to the next circle and you will see it has been duplicated. Use the transform tools on the new heart to change the size and shape slightly from the previous one. Each heart should be slightly different, ideally sized to match the size of it’s own circle. Repeat this until the top row is complete. Repeat steps 9 and 10 until you have filled all the circles on the right and left. The hearts should all point outwards. Your border should now be complete and the whole border should still be within one vector layer in the layers palette. To lift the border off the page slightly add a drop shadow. Double click the vector layer in the layers palette and choose drop shadow from the layer style panel. Copy the settings below. To give the shape a paper effect you need to add a texture. I am going to use this texture by Ofuin-Stock found via Abuzeedo. Paste the texture you want to use on top of your shape layer. Make sure the texture covers the whole of the canvas. If the texture is small think about adding this textured layer with a repeating version of the pattern. The layer palette should look similar to the panel below with the texture showing as the same size as the shape layer. Right click the new layer and choose ‘Create clipping mask’ from the options. The texture should now only fill your shape. This texture is a bit dark for the look that I want to achieve, so I am going to simply lower the opacity on the texture layer so the white from the shape layer shows through.